Documents wellhead system integrity. 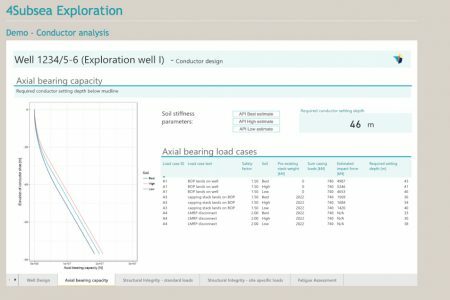 4Subsea’s conductor analysis documents that the conductor can maintain required integrity during the entire lifespan of the well. 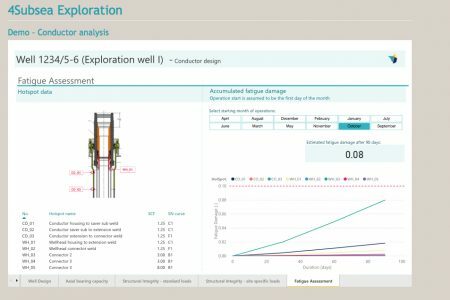 By tailoring the analysis to the specific rig choice, well location and design, we reduce cost by maximising the operational window and avoid oversized equipment. The conductor is the main load bearing component in a satellite well, typically drilled for exploration or appraisal purposes. In order to have control of the well, it is crucial that the conductor retains its integrity at all times. Primarily during the entire drilling campaign, but also in the case of an accident, such as loss of position or if a capping stack needs to be installed. By presenting the main results on our digital platform in addition to the traditional report, the consequence of installation tolerances, design choices or length of operations are visualized in a clear and understandable way. This enables you to select results based on actual well stick-up and inclination after installation, and to understand how it affects operation limits and service life. The conductor behaviour is dependent on a range of parameters. Waves and vessel motions govern the loads applied to the well; the well resistance is dominated by soil support and the strength of the well components. Our conductor analysis efficiently takes care of both the load and the resistance side, and investigates uncertainties in input when relevant. Conclusive assessments with recommendations on how to meet requirements, reviewed against operating guidelines.